We are a football-watching family. On any given Sunday during the season, we are hunkered down for a good part of the day at home with the likely chance of random family and friends dropping by. I like to prepare hearty, comfort food that can be left on the stove for everyone to help themselves whenever hunger strikes. I know many people think that it “never rains in Southern California,” but I assure you that is a myth. I’m not complaining, because we need the rain, but this has been a particularly rainy season. Today is a chilly and damp Sunday and the rain started early. 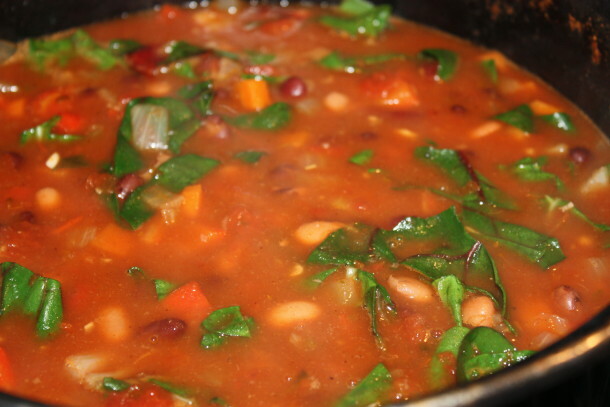 Perfect weather for vegetable chili! This recipe is completely vegan and no one has ever asked me, “where’s the beef?” This is a flavorful stew with lots of warming spices (but not spicy) to fuel your internal fire and keep you feeling toasty. I like to cook big batches of beans from scratch and freeze them for later use, but you can certainly use canned here. My favorite brand is Eden, one of the only companies NOT to use BPA in its cans. Hooray! They also cook their beans like I do, with kombu, a sea vegetable which adds extra minerals and alkalinity to the beans. You can use all the same kind of bean or mix and match. My favorites to use here are kidney, pinto and black beans all of which are top of the class in antioxidants. To make a complete protein, serve this over cooked brown rice, millet or quinoa. Lastly, I set out bowls of chopped avocado, lime wedges, and a terrific raw cheddar cheese I found at the farmer’s market and brought home and shredded. If the kids will eat more of this with a few tortilla chips dunked in, I say let them go for it. Heat oil in a large pot over medium heat. 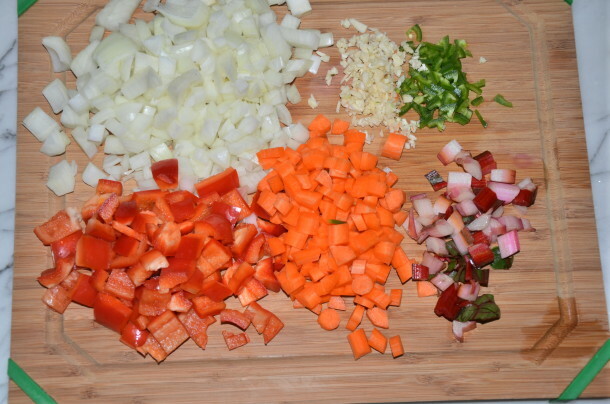 Add carrots, onion, bell pepper, chard stems, jalapeno and garlic, and cook until softened, about 10 minutes. Add oregano, cumin and chili powder and cook, stirring constantly, for 2 mintues. Addtomatoes with the juice, bay leaf, beans, water, salt and pepper. Bring to a simmer. Cover and reduce heat to low. Simmer for 1 hour. Discard the bay leaf. Add the Swiss chard leaves and cook, uncovered, until mixture has thickened slightly, about 20 minutes. Stir in chopped cilantro. Serve with cooked brown rice, millet or quinoa. How big a can of tomatos would you use? I only have cans! Sorry for the confusion. Use 2 14 or 15 ounce cans or 1 29 ounce can. I made this vegetarian. How many days would you keep it for in the fridge? Made tonight, Monday and thought of serving it for lunch on Friday. Not sure if I should freeze and thaw or just fridge till then? Since it’s vegan, nothing will spoil. It may thicken up a bit, so if you want to loosen the chili, just add a few tablespoons of water and reheat on the stove. Hi Pamela, this looks great. I’d like to make this in the pressure cooker and use uncooked soaked beans, to speed it up. I figure the beans should cook just fine with everything else. Any reason why that wouldn’t work? Could I use kale instead of the Swiss chard? Sure! Cook it a few minutes longer than chard. You sound like me — I’ll make everyone else a baked potato and I’ll go for the sweet potato. So good with the chili! One year I did a baked potato bar and a big pot of chili for the Super Bowl. Huge hit! Everyone comes to my house for Halloween and I think I may do this for that night. I loved the mixture of the sweet and savory from the sweet potato and chili. This was such a hit! My picky husband and two gluten-free (one lactose intolerant) daughters were thrilled tonight. I’ve been following your blog for a while but I was a little intimidated. I have decided that this year I really want to shift myself and my family toward a more plant based diet. This recipe as well as last Monday’s lentil & brown rice soup were so well received! I am definitely encouraged. I also plan on making a few other days of your weekly plan. Great recipes and relatively easy execution. Thanks so much!! Caren, this is great. I am so thrilled for you. And what a lucky family you have! Everything on my blog is totally doable, and I am excited to hear what you make next :). Could you add meat to this? either turkey or beef? Sure! Brown it first, remove from pot, sauté veggies, add back meat with seasonings, etc. Cook the same. I think you can add in half pound without changing the recipe. If you want to use more meat, you would probably need to take out some of the beans. I made this chili recipe to take to our Thanksgiving potluck since my husband is vegan and I try not to eat any meat. It’s delicious, tasty, and hearty!! Thank you for all the wonderful meal options!! I also doubled the recipe and have plenty leftover! I made this in the slow cooker but did not read about cutting the water in half and it was way too runny. It was still great, I just had to drain it. Why do you need less water in a slow cooker? That’s a good rule of thumb when you want to convert a recipe for the slow cooker. Slow cookers don’t allow any evaporation of liquid when you cook, as opposed to a pot which does allow steam to escape whether you realize it or not. Glad the chili was still salvageable! Another wonderful recipe! We loved it. I used a can of diced tomatoes because that is all I had. May have needed more liquid? I would use 2 t. salt. I also tried the quinoa cornbread for the first time tonight, which was a perfect pairing with this chili. Just made this for dinner tonight, how funny! I wonder if your tomatoes had salt added? Love this with the quinoa cornbread! Thanks, Lisa! Searching your website for some new recipes (love the slow cooker chicken tacos!). 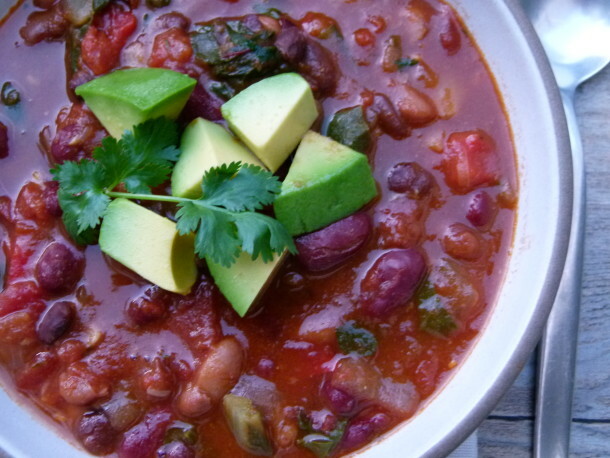 Is the Jalapeño in this veggie chili too hot for young kids? Does this freeze well? 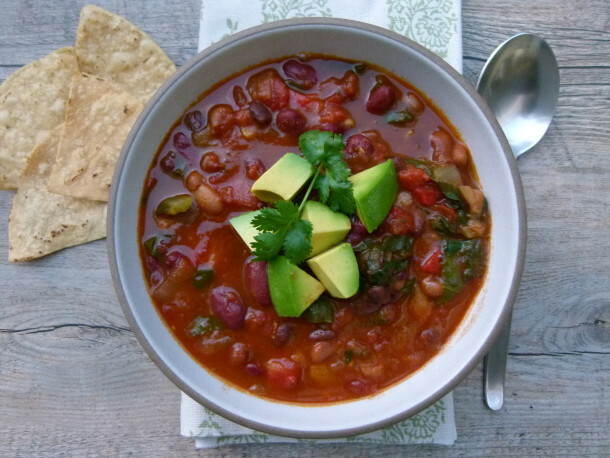 Husband doesn’t like sweet potatoes so I have stayed away from your slow cooker version but do you have a slow cooker veggie chili recipe? Lots of questions but love your site! I shared this link with Healthy Child Healthy World! I love this recipe!!! I made it earlier in the week and decided it was so yummy I simply had to make it again. Nice! It also taste great after a few days in the fridge. I’m making it Sunday for football-watching. Go Giants! It’s the bomb, I recommend any chili-crazed cook try it. I’m a sucker for good chili and order it all over the country whenever I get a chance collecting recipes and favorite spots. I decided to try this one evening and was missing 3 ingredients (2 vegetables and 1 spice) – and BAMMM, it was awesome! Since then, I’ve made it 5 times, the proper way, and can’t wait to make it a 6th time. What an endorsement! Thank you. This chili is now my favorite comfort food. It was delicious and I didn’t even miss the meat! It is also a great way to get more veggies! Excellent!!! I totally agree — I don’t miss the meat one bit. 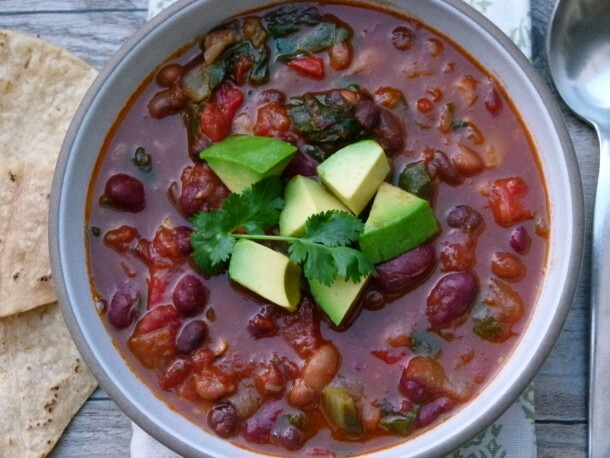 This chili is great and so healthy! Thanks for helping me get out of my cooking rut! try this one because we love veggies. It was outstanding! I made this recipe while we were getting 20 inches of snow here in NY! It couldn’t have been more perfect to warm us up. The next day I had it for lunch and it was even more delicious. The swiss chard is a wonderfully mild complement to the spiciness of the chili. The avocado is a great topping. This dish is definitely a wintertime staple for us! This is my go to meal when the kids have a crazy schedule. I prepare all the ingredients in the morning when they go to school and cook after pick up. It sits on the stove with fixings in the fridge and everyone serves themselves between activities and me carpooling. Brilliant and delicious. You’re a genius. It’s also awesome the next day. Fantastic chili! The entire family (including three young kids) devoured this … and my three year old just asked to have it again for breakfast! I hope you let him! Nothing wrong with veggie chili for breakfast.